Sustainable Supply Chains: Why Are They Important? Being sustainable should be an essential consideration and aim for any business and your supply chain should be no different. Although it is often identified as being one of the most difficult aspects of a business to make sustainable, it is one of the most important and holds more benefits than you may think. This post will explore why you should use them, what the benefits are and how you can go about ensuring your supply chain is sustainable. Why use sustainable supply chains? Calculating and controlling your carbon footprint should be of paramount importance to a business, the sustainability and conservation of the environment is a serious issue not to be ignored. One of the biggest impacts a business can have is to make its supply chain more sustainable. This can lead to a much wider impact than just locally within the business you’re in, but worldwide. A sustainable supply chain can massively reduce the amount of wasted resources, increase efficiency and reduce the spending on resources consumed within the process of bringing a product to market. Creating a sustainable supply chain is not simply about buying into the concept of morality, but more the practicality of making better decisions to reduce costs, improve productivity, supporting growth and make longer-term decisions. A common misconception associated with a sustainable supply chain – or simply having one closer to home – is increased costs. But despite upfront costs, investment in sustainability can significantly reduce expenses in the long term, help increase the perceived brand value by customers and help improve the lives and working conditions of those early on in the supply chain. So, the benefits of using a sustainable supply chain can surpass your expectations, reducing costs in the long term as opposed to increasing them. A UN global initiative named United Nations Global Compact sets out 4 goals for businesses around the world to adopt social responsible policies. The 4 general areas sustainability issues fall into are; Human Rights, Fair Labour Prices, Environmental Progress/Protection and Anti-Corruption measures. With considerations in all 4 of these areas you can ensure you are achieving the most sustainable supply chain possible. This again highlights the importance of considering a sustainable supply chain, that the benefits stretch far beyond simply just costs. Sustainability is something all forward-thinking businesses should, and must consider. The benefits to use them allows for benefits to not only your bottom line but to society as a whole and also to individuals within the supply chain too. To talk about your business and its carbon footprint, get in touch with us today. Being sustainable has positive impacts on society and the planet, reducing the amount of resources used and ensuring that the methods used in your production are sustainable, in the long run is crucial. However, many may be unaware to the other aspects associated with sustainability, the effects it can have on wider society – setting the standards for other companies to step up to. Closer to home, ensuring better working conditions for those in your supply chain can also help drastically increase the livelihood and living conditions of those effected by your business. Ultimately, actions like this do not go unnoticed; remember, sustainability isn’t just about being green and environmentally friendly. 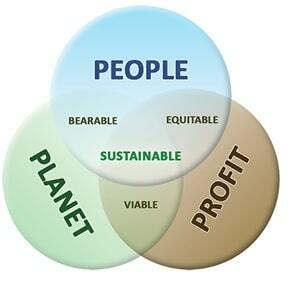 Consider the triple bottom line of people, planet, and profit. https://compareyourfootprint.com/wp-content/uploads/2016/10/logo-1.png 0 0 Will https://compareyourfootprint.com/wp-content/uploads/2016/10/logo-1.png Will2017-08-12 19:36:532017-08-12 19:36:53Sustainable Supply Chains: Why Are They Important?